Alcohol giant Constellation Brands Inc. is making a foray into marijuana, a precedent-setting move for an industry that has mostly stayed on the sidelines during the cannabis boom. Constellation will pay about C$245 million ($191 million) for a 9.9 percent stake in Canopy Growth Corp., a Canadian seller of medicinal-marijuana products. 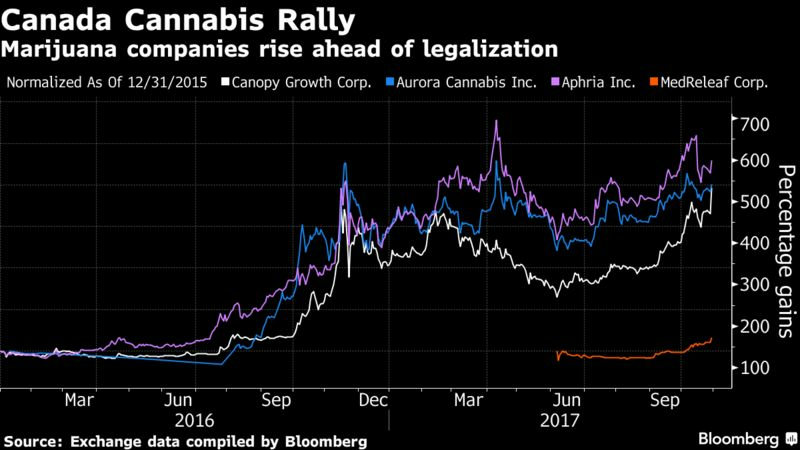 The deal kicked off the biggest rally in nearly a year for Canopy, which trades on the Toronto Stock Exchange under the ticker WEED. Constellation, based in Victor, New York, said it has no plans to sell cannabis in the U.S. or other markets until it’s legal “at all government levels.” For now, it’s more a matter of identifying markets with growth potential, said Chief Executive Officer Rob Sands, whose company sells Corona beer, Svedka vodka and other brands. “Our company’s success is the result of our focus on identifying early-stage consumer trends, and this is another step in that direction,” he said in a statement. For Canopy, the deal values the business at roughly C$2.5 billion, catapulting it into the highest echelons of the marijuana industry. Constellation also would become the company’s biggest shareholder. Canopy’s stock gained as much as 23 percent to C$15.72 on Monday, marking its biggest intraday jump since November 2016. The transaction also boosted the shares of other cannabis stocks, as investors bet that future deals are in the offing. Shares of MedReleaf Corp. rose as much as 16 percent, Aurora Cannabis Inc. gained 8.4 percent, and Aphria Inc. was up 11 percent. As part of the Constellation agreement, the two companies will collaborate on cannabis-based beverages that can be sold as adult products — but only in places where the products are legal at the federal level. While Canada plans to legalize recreational marijuana by July 2018, the initial product offerings will be limited, said Bruce Linton, Canopy’s CEO. Edibles and cannabis-infused beverages won’t be permitted at the outset. That will change in the coming years as Canada moves to extinguish the black market and these products will be phased in over time, he said. In the U.S., meanwhile, 64 percent of the population now wants to lift the ban on cannabis, according to a Gallup poll released last week. That’s the widest margin since the firm began asking about the topic in 1969, when only 12 percent of the population approved.